The Ski Lion — Ginger writes. Waterskiing is also a lion you cage in your study, except this time my study is the lake laid bare in front of me. The lake I look out the window and see while I write. Annie Dillard probably didn't realize how all-inclusive her words were when she penned them on the subject of writing. I do not so much write a book as sit up with it, as with a dying friend. During visiting hours, I enter its room with dread and sympathy for its many disorders. I hold its hand and hope it will get better. This tender relationship can change in a twinkling. If you skip a visit or two, a work in progress will turn on you...It is a lion you cage in your study. As the work grows, it gets harder to control; it is a lion growing in strength. You must visit it every day and reassert your mastery over it. My slalom skiing has many disorders. I don't keep my hips forward as I should and I forget to square my shoulders to the boat. I let slack get in the rope and I bounce across the wake. I fail to let the ski lay on its side properly so it can cut into the wake. And I can only hit two buoys (barely) on the slalom course. I realize that this dying friend, this dear beloved sport of mine, has no chance of recovery unless I visit it all the time. That means every time TJ puts the boat in the water to pull the kids on the tube, I must forget about my just-washed hair and ignore my sore muscles from last time. Visiting hours are upon us. 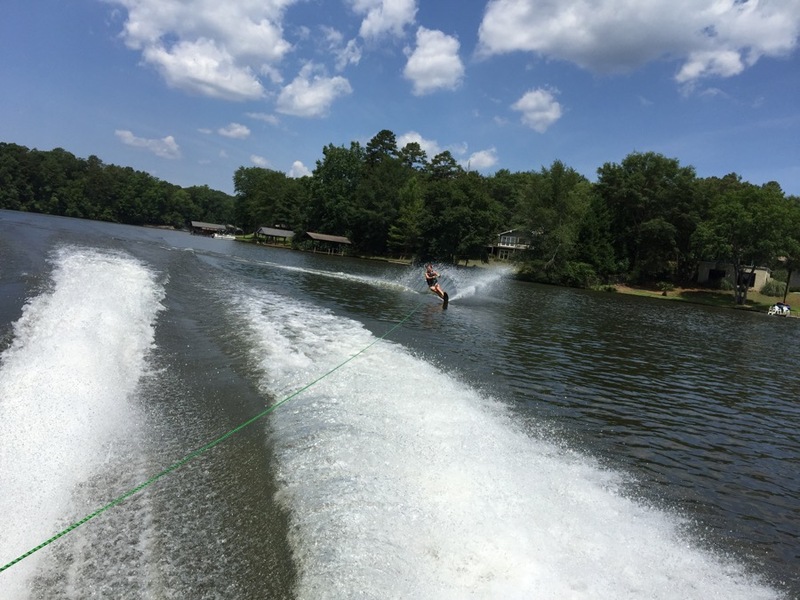 For my birthday a couple weeks ago, I got a waterski lesson from our neighbor across the lake. Andy is 62 and has been skiing for decades. He and another neighbor Steve go past our house a few times a week tearing up the lake. I asked Andy if he would give me a lesson and he agreed. So the day before my birthday, with the kids being watched by my neighbor Paula (yes, so many neighbors, I know! ), TJ and I went out on Andy's boat. Andy's wife Barbara did the driving so that Andy could watch me ski and give instruction. I would ski for a while, then rest for a while, with Andy coaching me on how to improve. I realized what a disordered lion I have in my cage, but I am happy to report that my lion is willing to learn and work hard. We stayed out for almost two hours on Andy's boat, with me skiing more that one Saturday morning than on any other day since we moved to the lake. My soreness ran until the following Saturday, no lie. But I was out there skiing (in sore form) at 6:45 am on Tuesday morning and again on Tuesday afternoon and a third time on Thursday afternoon. My forearms hated me for all that. But since my lion is going to grow in strength one way or another, I'd rather assert my mastery over it and watch it grow into a fierce and bold thing, a thing of grace and beauty, a story of a dream come true. God, I do not for a minute take for granted the beauty of this lake or the beauty of doing something I love. You are the giver of all good things. As a prayer in The Valley of Vision says, "I bless You for...the body You have given me, for preserving its strength and vigor, for hands, eyes, ears to do Your bidding." I pray that even as I am strong in body to go skiing and strong in the will to work to improve, that I would also be strong in my desire to love You wholeheartedly and to do Your bidding. I pray that our lake will be a continued blessing and never a curse to our family or to any others who enter our property. We look to You to give protection, wisdom, community, and fun to our family and to all those You allow us to bless. Amen.